Cranberry Sauce | Om nom nom! 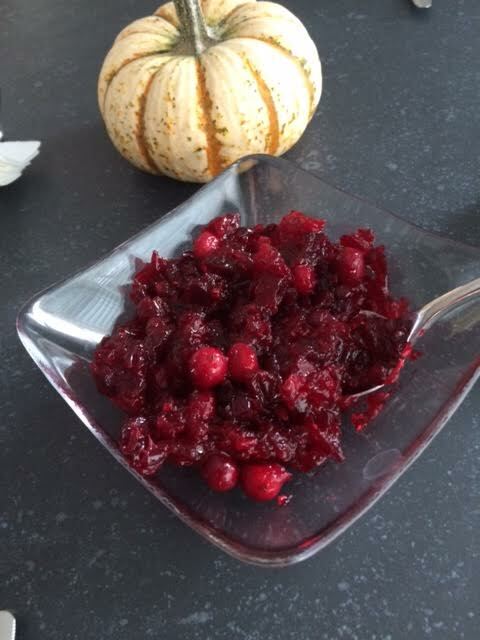 Cranberry sauce is shockingly easy to make from scratch, and this is my general go-to for it. You will have to adjust orange/sugar/etc. to your taste and as you cook – for example, I find the sugar just right on this as someone who doesn’t have a sweet tooth, but you might like more! This is an easy one to make ahead…one less thing on your plate for the day of. Empty a 12-ounce bag of fresh or frozen cranberries into a saucepan and transfer 1/2 cup to a small bowl. Add 1 cup sugar, orange zest and 2 tablespoons orange juice to the pan and cook over low heat, stirring occasionally, until the sugar dissolves and the cranberries are soft, about 10 minutes. Increase the heat to medium and cook until the cranberries burst, about 12 minutes. Reduce the heat to low and stir in the reserved cranberries. Add sugar, salt and pepper to taste and cool to room temperature before serving.